Based on our prior research we have found that a large number of people are missing out on best practice care and this is leading to many avoidable deaths, especially from heart attack and stroke. 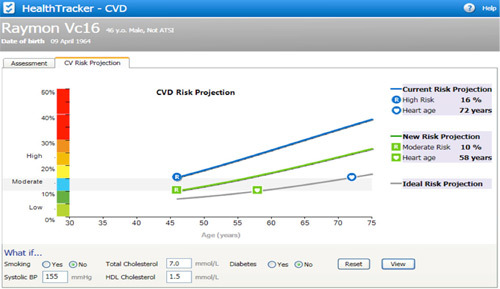 HealthTracker is an electronic system that provides tailored management advice to doctors, practice staff and patients to reduce the risks of heart attack and stroke. A large body of international evidence has shown that electronic decision support systems may lead to better quality care. Despite this, development of these systems in Australia has been limited and HealthTracker is the first of its kind to be developed for primary health care services. We have successfully implemented HealthTracker within 20 Aboriginal Community Controlled Health Services (NSW and Queensland) and General Practices in NSW over the last 12 months as part of a randomized control trial. Outcomes are expected in end of 2013. We have received funding from NSW Health to extend HealthTracker CVD to a further 10 NSW ACCHSs and General Practices (where there a high numbers of Aboriginal People). This has commenced in August 2012. 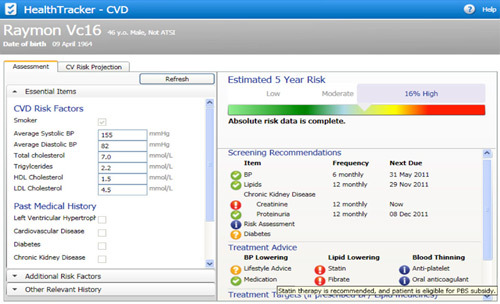 This is not a randomized control study – all Services and general practices have received Health Tracker CVD and also training and support. Eligibility is simply that the health service has a high Aboriginal client base and uses either Medical Director or Best Practice.